After reading this piece from SB Nation, I got inspired to make Hoop Nut’s very own Playoff Projections for the current season. By projections, I mean simply looking at the current crop of teams playing for Playoff spots or playing the rankings game. This is meant as just ONE WAY (and there are many other ways I’m sure) of seeing how the rest of the regular season might turn out, and, therefore, which teams will make the postseason, which teams will have an early summer, and what the possible Playoff seedings might be. the season ends in about 8 weeks? It’s an insane task. I concede that maybe most of the things you’ll read here might not even happen, but, hey, that’s never stopped me before, and, well, this is why it’s fun to cover NBA basketball. Also, please keep in mind that the methodology used to produce the following commentary is not exactly rocket science. Heck, it might not even qualify as seventh grade algebra. The thing is, I don’t want to be too technical, too number-ish, with how this going to go down. I wanted to keep it simple and accessible enough so that even the slowest student in Mr. Oracion’s Math class can understand it (this student probably doesn’t pay much attention in class because he’s too busy thinking of the NBA in the first place). Having said that, there will be some numbers included (of course!) just to give this some semblance of statistical reliability. 1) I will not look at all 30 NBA clubs. I will look at only the Top 8 teams in the East (MIA, NYK, IND, ATL, CHI, BRO, BOS, and MIL) as well as the Top 11 teams in the West (SAS, OKC, LAC, MEM, DEN, GSW, UTA, HOU, LAL, POR, and DAL). I think the East’s Top 8 are pretty much set already. Though I’m not discounting its possibility, PHI making the Playoffs (the Sixers are 6 games behind the eighth-seeded Bucks) is a real stretch – a stretch I don’t want to stretch even further by including it here. Things are different out West, however, because there are as many as 6 teams vying for the 6th to 8th seeds. Now THAT I’m willing to stretch. d. # of remaining games against “weaker” teams. 3) Please take note that teams will be labeled “stronger” or “weaker” depending on their place in Hoop Nut’s Power Rankings as of Week 17. 4) Now this is where the numbers come in. Because the season is pretty much 75% finished already, I’ll use 75 as my peg (told you this wasn’t rocket science). For the remainder of a team’s schedule, I will “predict” that any given team will win 75% of its games against “weaker” competitions, while losing 75% of its games against “stronger” foes. In using 75%, I believe I am accounting for the strength of each team relative to its opponents, but also for the probability or improbability of an upset. Of course, this could all just be hogwash, but what the hell, right? a. In Houston’s case, the team’s current standing is 32 wins against 28 losses for a total of 60 games. That is good enough to put the Rockets at eighth spot in the West and 2.5 games ahead of the Lakers. It also means Houston just has 22 games remaining before the postseason begins. b. Of those 22 games, 9 are against “stronger” teams and 11 against “weaker” foes. c. Using the 75% peg, the Rockets will win 2.25 games against “stronger” opponents – let’s round that down to an even 2 games. Conversely, they will win 8.25 games against “weaker” teams – let’s round that number to an even 8. In total (2 + 8 = 10 wins), Houston will go 10-12 to finish the season with a 42-40 record. Where that places them in the context of the Playoffs, of course, still depends on the projections for the other teams. Phew. Okay, enough of the stuff only calculators will understand. Now let’s proceed to the stuff we hoop nuts are really after. Note: All standings and schedules were taken on March 3, 2013 (Manila time). 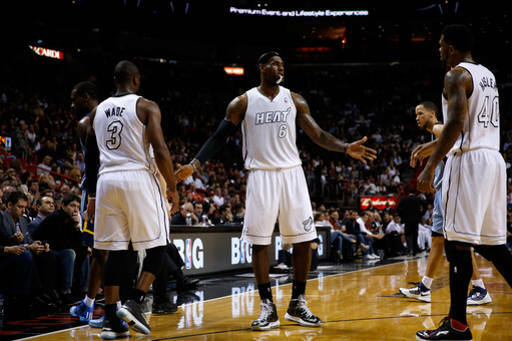 e. Commentary: Considering the way the Heat are playing, it’s tough to imagine them losing 6 games in about eight weeks. It pains me to the bones to say this, but 20 more wins might actually be the baseline for this squad. In fact, I’m 110% sure they’ll clinch the East’s top spot well before the season formally ends. If there’s one thing that MIGHT make them meet the 6-loss projection, it’s this – coach Spo might rest his stars with about a week to go. LBJ won’t need the rest, but Miami’s other guys, most notably Udonis Haslem, Ray Allen, Dwyane Wade and Chris Bosh, will probably welcome the short respite before the grueling Playoffs. This early, the Heat are virtual shoo-ins for the homecourt advantage in the East. e. Commentary: The Knicks will benefit from a relatively “light” schedule to end the season. Of course, that doesn’t necessarily mean it will be easy. Some of the “weaker” teams include Utah, Golden State, Boston, Atlanta, and Milwaukee. If the Knicks continue to be as inconsistent as they were this past month (5-5 in their last 10), then 17 more wins might actually be optimistic. e. Commentary: Wow. The Pacers, should things pan out, actually have a strong chance of overtaking New York and finishing second in the East. April 14 will be the big date, as the Pacers and Knicks rock the MSG that night. Whoever wins that game might as well enjoy homecourt till the Conference Semifinals. e. Commentary: With a frontline currently playing better than any other frontline in the league (yes, even if one forced LBJ as a 4 and Bosh as a 5), the Hawks have been mighty nasty, winning 7 of their last 10 games. They have no chance in hell of winning their division, but they have a strong chance of gaining homecourt in the first round. e. Commentary: It’s going to be a tough stretch for the Bulls. Truth be told, 13 more wins might be reaching, but if Joakim Noah can continue nightly near-triple-doubles, and if Carlos Boozer and Luol Deng can hit their shots, then the Bulls can keep their spot in the middle of the postseason pack. The catch is the next team on this list has a much lighter sked. e. Commentary: The Nets will be gifted with a lighter schedule compared to most of the squads here, but the question is can they really make the most out of it? I mean, this is a team that went 5-5 in its last 10, with strong wins over the Pacers, Nuggets and Bucks (twice), but nobody should forget this is also a team that just lost 4 of its last 5.
e. Commentary: The myth that Boston is better without Rajon Rondo is just that – a myth. It is, however, not a myth that Boston will really have to scramble to have a sliver of hope to rise in the East Playoff seedings. Once the Cs manage to get in the Playoffs, though, I honestly believe whoever draws them will think themselves terribly unlucky. e. Commentary: So get this, the Bucks have gone 3-1 since getting JJ Redick. Will they continue winning 75% of their games till the end of the season? Hell no, but that doesn’t mean the rest of the league shouldn’t be wary. Redick has been quite a difference-maker, averaging 15.0ppg since trading sunny Florida for, um, Wisconsin. It’s a pity that the Bucks will have to face the indomitable Heat in the first round because if it were any other team (seriously! ), the Bucks might actually spring an upset. Orlando, FL (Sports Network) - James Harden registered a team-high 24 points, eight assists and seven rebounds, as the Houston Rockets defeated the Orlando Magic, 118-110, at Amway Center. Harden shot 7-of-18 from the field, but was 10-of-11 from the free throw line for the Rockets, who have won three of their last five games. Harden and Patrick Beverley combined for 21 of Houston's 32 points in the fourth quarter, as the Rockets used a big run to overtake the Magic. Chandler Parsons and Carlos Delfino scored 21 points apiece for the Rockets. Donatas Motiejunas added 17 points and Omer Asik recorded nine points and 12 rebounds. Tobias Harris recorded a double-double with 27 points and 10 rebounds off the bench in the loss, Orlando's seventh in eight games. Arron Afflalo scored 19 points and Nikola Vucevic had 18 points and 10 rebounds. 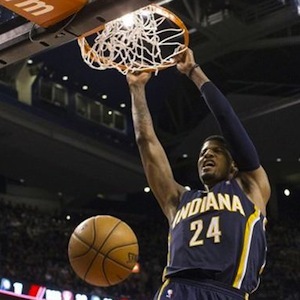 Toronto, ON (Sports Network) - Paul George and David West both turned in double-doubles to lead the Indiana Pacers to a 93-81 win over the Toronto Raptors on Friday. George finished with 22 points and 10 rebounds while West added 15 points and 11 boards for the Pacers, winners in six of their last seven. Roy Hibbert scored 18 points in his first game since returning from a one-game suspension for his role in a fracas with Golden State on Tuesday. Rudy Gay, who was battling lower back discomfort all game, poured in 21 points, while Alan Anderson and John Lucas III added 14 and 10 points, respectively, for the Raptors, who have dropped three in a row. Washington, DC (Sports Network) - Carmelo Anthony poured in a game-high 30 points on Friday to help the New York Knicks notch a 96-88 victory over the Washington Wizards at Verizon Center. Raymond Felton followed with 23 points and six assists, while J.R. Smith added 13 points and 12 rebounds off the bench for the Knicks, who have won three straight on the heels of a four-game skid. Bradley Beal posted a double-double with a career-high 29 points and 11 boards, while John Wall netted 16 points and handed out six assists in Washington's second straight setback. Boston, MA (Sports Network) - Paul Pierce paced Boston with 26 points and Jeff Green added 18 off the bench as the Celtics stayed hot at home with a 94-86 victory over the road-weary Golden State Warriors on Friday at TD Garden. Kevin Garnett chipped in with seven points and took sole possession of 10th place on the all-time rebounding list by hauling in 13 boards in Boston's eighth straight home victory. Stephen Curry wasn't nearly as deadly with his shooting on Friday in following his 54-point performance against the Knicks two days earlier. He scored 25 points, but shot just 6-for-22 from the field in the Warriors' third straight setback of a four-game East Coast road trip. David Lee returned from a one-game suspension and totaled 10 points and 19 rebounds in the loss. Cleveland, OH (Sports Network) - Jamal Crawford tallied 24, and the Los Angeles Clippers got double-doubles from Blake Griffin and Chris Paul in a 105-89 victory over the Cleveland Cavaliers. Griffin ended with 16 points and 11 rebounds, while Paul contributed 11 points and 15 assists, as the Clippers notched their fourth straight win and eighth in their last nine tries. Caron Butler donated 13 points for the Clippers, who gained their first victory in Cleveland since March 10, 2002, the year before LeBron James was drafted by the Cavaliers. This was just their fifth win in the last 21 meetings overall against the Cavs. The Cavaliers were simply overmatched, especially considering Kyrie Irving (hyperextended right knee) was out for a third straight game. Tristan Thompson had 15 points and 12 rebounds, while Dion Waiters scored 17, one more than C.J. Miles. Brooklyn, NY (Sports Network) - Vince Carter poured in 20 points on 7-of-12 shooting from the field to lead the Dallas Mavericks to a 98-90 win over the Brooklyn Nets at Barclays Center. Dirk Nowitzki also finished with 20 points and pulled down eight rebounds and O.J. Mayo added 17 for the Mavericks, who had dropped three straight entering the contest. Deron Williams poured in a game-high 24 points and Brook Lopez added 19 points and nine rebounds for the Nets, who have dropped three of their last four. Joe Johnson, who had missed three straight games with a foot injury, scored 11 points and dished out six assists in the setback. Miami, FL (Sports Network) - It wasn't the offensive onslaught we're accustomed to seeing from LeBron James, but when his team needed a bucket, the Miami superstar stepped up. James poured in 14 points in the fourth quarter, including a clutch 3-pointer late in regulation to help the Heat extend their win-streak to 13 games with a 98-91 triumph over the Memphis Grizzlies on Friday at AmericanAirlines Arena. James finished with 18 points, 10 assists and eight rebounds, while Dwyane Wade led the way with 22 points and eight assists in Miami's 11th straight home victory. Marc Gasol scored a game-high 24 points and grabbed nine boards, while Mike Conley and Zach Randolph donated 14 points apiece for the Grizzlies, who saw their eight-game winning streak come to an end. New Orleans, LA (Sports Network) - Greivis Vasquez scored 13 points in the fourth quarter and led the New Orleans Hornets to a 100-95 win over the Detroit Pistons on Friday. Vasquez had 25 points and nine assists in the game for the Hornets, who came into the game off a 45-point loss against Oklahoma City on Wednesday. Eric Gordon scored 21 points and Ryan Anderson recorded a double-double with 19 points and 13 rebounds. Greg Monroe had a game-high 27 points and 10 rebounds and Brandon Knight added 22 points for the Pistons, who have lost four of their last five games. Kyle Singler and Jason Maxiell scored 10 points apiece. San Antonio, TX (Sports Network) - Tony Parker was among eight San Antonio players in double figures with 13 points, but the All-Star guard sprained his left ankle in the third quarter of the Spurs' 130-102 blowout of the Sacramento Kings. DeJuan Blair had 16 points, while Danny Green scored 15. Manu Ginobili had nine points and a career-high 15 assists, as the Spurs bounced back from a 105-101 overtime loss at home against Phoenix on Wednesday. That defeat snapped an 18-game home winning streak. Tiago Splitter ended with 14 points and 11 rebounds, while Tim Duncan contributed 13 points and 10 boards. Parker drove the lane for a layup with under five minutes left in the period, but he landed awkwardly as the ankle buckled upon hitting the floor. Parker was helped off the court. Prior to leaving, Parker also had seven assists. He sat out a game at Phoenix on Sunday due to a right triceps contusion. Marcus Thornton scored 25 and Isaiah Thomas had 18 points for the Kings, who lost for the 17th time in the last 18 meetings with the Spurs. Tyreke Evans scored 10, but the Kings fell for the seventh time in their last eight games. Phoenix, AZ (Sports Network) - Goran Dragic left in the third with a back injury, but Marcus Morris led a spirited bench effort to help the Phoenix Suns down the Atlanta Hawks, 92-87, and capture their third straight win. Dragic had 19 points with six assists before exiting, but Morris helped keep the Suns afloat by making 4-of-5 from long distance to finish with 16 points. Phoenix's bench tallied 58 points as a unit, with Wesley Johnson scoring 15, Jermaine O'Neal donating 12 and Markieff Morris adding 11 in the victory. After winning the first three of their six-game road trip, the Hawks fell in search of their sixth consecutive victory on the road overall. Al Horford scored 20 points and Kyle Korver chipped in with 17 points and eight rebounds. Josh Smith was held to five points on 2-for-11 shooting, but grabbed 10 boards and handed out five assists in the setback. Salt Lake City, UT (Sports Network) - Enes Kanter poured in 23 points and pulled down 22 rebounds to lead the shorthanded Utah Jazz to a 98-68 rout of the Charlotte Bobcats on Friday. Kanter went 10-for-12 from the field filling in for Al Jefferson, who sat out with a sprained left ankle. Gordon Hayward added 14 points and Derrick Favors finished with eight points and seven rebounds for the Jazz, who were also without forward Paul Millsap due to a left ankle sprain. Byron Mullens scored 12 points and pulled down seven rebounds and Ramon Sessions added 11 points off the bench for the Bobcats, who have dropped five straight and 13 of their last 15 games overall. Denver, CO (Sports Network) - Wilson Chandler carried Denver with a career- tying scoring effort, but it was Ty Lawson whose deciding bucket pushed the Denver Nuggets to their fourth straight win, a 105-103 decision over the Oklahoma City Thunder. Lawson, who was just 4-of-13 prior to his winning bucket with 0.2 seconds remaining, used a crossover to create some space before rising above Thabo Sefolosha on a pull-up jumper. He finished with 11 points and seven assists. Chandler posted 35 points on 13-of-19 from the field, hitting on 6-of-7 from long distance. Corey Brewer and Andre Miller each contributed with 14 in the triumph. The Thunder were seeking a fourth straight victory as well, but came up just short after rallying from a 12- point fourth quarter deficit. Russell Westbrook scored a game-high 38 points and Kevin Durant finished with 25 to go with 14 rebounds in the setback. CHICAGO (AP) - Joakim Noah had 21 points and 10 rebounds, Carlos Boozer scored 20 points and the Chicago Bulls beat the Brooklyn Nets 96-85 on Saturday night. The Bulls went on a 19-0 run that started in the second quarter and stretched into third, giving them an 18-point lead. They opened March on a winning note after going 5-8 in February, just their second losing month in 2 1/2 seasons under coach Tom Thibodeau. Noah followed up the third triple-double of his career with another terrific performance that also included four blocks. He committed five turnovers, but it sure was an impressive follow-up to Thursday's gem, when he had 23 points, 21 rebounds and a career-high 11 blocks in a win over Philadelphia. MILWAUKEE (AP) - Monta Ellis scored six of his 23 points in overtime and Ersan Ilyasova and Brandon Jennings added five apiece in the extra period to spark the Milwaukee Bucks over the Toronto Raptors. Ilyasova finished with 29 points and 11 rebounds, while Brandon Jennings had a career-high 19 assists, including one in overtime. Kyle Lowry had a triple-double with 10 points, 10 rebounds and 10 assists, Alan Anderson scored 21 points off the bench and Amir Johnson added 19 for Toronto, which lost for the fourth consecutive time and fifth in six games since tying a season best with a five-game winning streak. PHILADELPHIA (AP) - Evan Turner had 22 points, 10 rebounds and nine assists, Jrue Holiday scored 27, and the Philadelphia 76ers snapped a seven-game losing streak with a victory over the Golden State Warriors. Thad Young had 14 points and 16 rebounds and Royal Ivey chipped in with 17 points for the Sixers, who are 5 1/2 games behind Milwaukee for the final playoff spot in the Eastern Conference with 25 games left. Stephen Curry scored 30 and Klay Thompson added 29 for the Warriors, who've lost four in a row. PORTLAND, Ore. (AP) - Damian Lillard scored 24 points, J.J. Hickson added 18 points and 16 rebounds and the Portland Trail Blazers beat the Minnesota Timberwolves to earn only their second win in nearly a month. LaMarcus Aldridge had 17 points and eight rebounds for Portland, which had six players score in double-figures. The Blazers jumped out to a 10-point lead in the first quarter and led by as many as 18, while the Timberwolves never challenged. Derrick Williams had 23 points and eight rebounds to lead the Wolves, who have dropped their last five games and 21 of 25. Luke Ridnour added 18 points and six assists, and former Blazer Dante Cunningham had 16 points and eight rebounds off the bench.